Driving by, you wouldn’t be blamed for completely missing the food court in Dixie Park. Housed in a nondescript building in a somewhat industrial stretch of road along Dixie, it doesn’t look like much. The seemingly perpetual construction right outside certainly doesn’t help matters. Those who venture inside will find a pretty good Asian food court. It’s generally nothing you’d want to go too far out of your way for, but most of the vendors here serve decent quality Chinese food (they’re mostly Chinese, with one Vietnamese place and one Japanese), with cheap prices and voluminous portions. The best one is easily Dynasty B.B.Q. (Well, there was a Korean place that I used to really like — their pork bone soup was particularly delicious. Sadly, it closed down and was replaced by the aforementioned Vietnamese place. R.I.P., Korean place. You are missed). 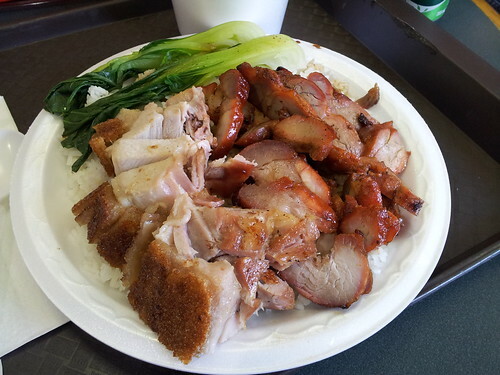 They have a typically comprehensive menu, though the real gem is the dish that comes with a combo of roast pork and BBQ pork. Featuring a heaping portion of both types of pork served on top of rice (it also comes with a cup of mediocre soup that you should probably skip altogether), it’s a steal at $5.50. Though the less showy BBQ pork is certainly tasty and absolutely worth eating, it’s the roast pork that is the real reason to come here. I can’t claim to be an expert on this particular dish, though I have had it at a few different places. This is the best version of it that I’ve had. Perfectly cooked and yieldingly tender, with a satisfying layer of unctuous, melt-in-your-mouth fat, not to mention the salty, addictively amazing crispy, crunchy skin, it’s pretty outstanding.